This is a collection of photographs from British Astronaut Tim Peake’s time on the International Space Station. I’ve always found space fascinating and I’m considering buying this for Lucas as he is just getting into it. I love the idea of it inspiring some young children to learn more about space and science. Tim is also giving the proceeds he receives from this book to The Princes Trust. I am obsessed with this book! It’s probably not going to be for everyone but I just love it, it’s based on an Instagram account of the same name and is exactly what it says it is – gorgeous photos of cabins. If you know someone who dreams of a simpler life then this is the perfect book for them. I just had a quick look through it in a book shop and it is truly inspiring and makes me want to run off and live in my own cosy cabin. Word of warning, don’t buy this for a parent blogger as chances are they will already have it but definitely do buy it for parent friends. It is the first book from blogger Hurrah For Gin and it is guaranteed to make you laugh out loud. I think every single parent can relate to the frustrations of children so brilliantly captured in Katie’s drawings. My husband was given this book for his birthday and although the theme isn’t particularly festive he says it is such an important and thought-provoking book to read. It’s a collection of short stories and poetry based on human rights from different authors including Neil Gaiman, Matt Haig and Frances Hardinge. All royalties go to Amnesty International. This is a follow up to Matt Haig’s A Boy Called Christmas, I haven’t read either of them but I spotted them in Waterstones and they both look brilliant. They’d make a nice gift to give to a family, they’d be lovely to aloud to older children and sound perfect if you’re trying to hold onto the magic a little longer. 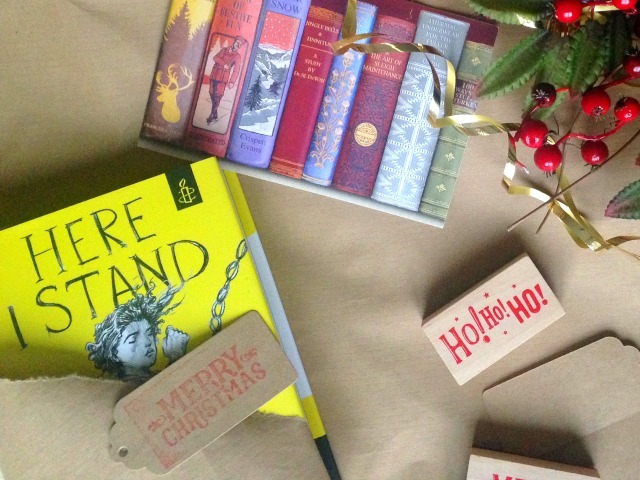 A little shout-out to a few books which aren’t under £10 but are still worth considering as a gift. Firstly 111 Places In Liverpool That You Shouldn’t Miss, I picked this up in a little bookshop in Liverpool and it is fantastic but obviously, mostly helpful to people who live close to Liverpool. Also the #CookForSyria Recipe Book comes out this week, it has so many great contributors and all profits from the book go to UNICEF’s Children of Syria fund. Finally, a must for any Harry Potter fans is the new illustrated edition of The Chamber Of Secrets. Not my favourite Potter book but these illustrated editions are so beautiful that they are well worth collecting. I haven’t been asked to write about any of these books, I just wanted to share a few of my favourites. However, this post contains affiliate links which means if you buy a book from my link I will receive a small commission but it won’t cost you any extra. Lovely suggestions. Hurrah for Gin is so brilliant isn’t it?! A must for any parent!! I really fancy Tim Peake’s book – I loved following his journey in space. Some great choices here! Here I Stand sounds like something I need to read, not because it’s enjoyable but because it is important. Need to read the Matt Haig books too!